absolute peaceful haven. 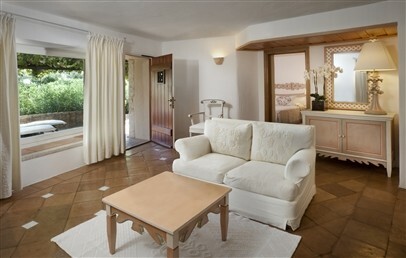 Ideal to relax, for travellers looking for their privacy but with the eventual possibility of a social evening. Classy service, discreet, attentive to details. Hotel Pitrizza, exclusive elegant holiday location, nestled between the rocks and flowers of the scrub, overlooking the bay of Liscia di Vacca and its turquoise sea. The whiteness and brightness of the sand and the typical vivid colours of the Costa Smeralda sea will give you breathtaking views. Exclusive villas with selected customers, the Hotel Pitrizza is designed to fit harmoniously with the surrounding nature, following the typical Sardinian style and taking care of every detail, with hand made furniture. 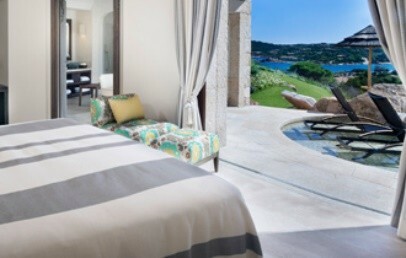 The pride of the hotel is the beautiful saltwater pool, carved into granite rock. 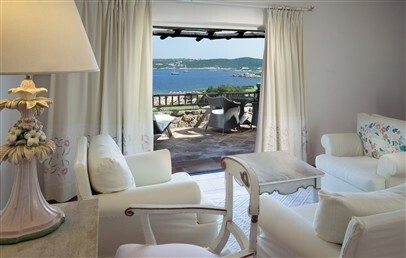 The double rooms (Classic, Deluxe, Premium), decorated with white walls and wood furniture, have a balcony with chaise longue and chairs, overlooking the sea or the well-groomed gardens. 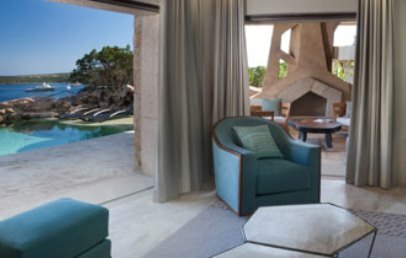 The Suites (Deluxe and Premium) overlook the sea or the gardens, have a private terrace and a spacious living room in Sardinian style, using local materials such as wood and above all granite, which gives beautiful colour nuances. Special attention should be given to the Royal Suite, with its 69 sq.m. and the wonderful balcony that offers a unique view of the surrounding nature, and the Presidential Suite, a corner of paradise of 159 sq.m., consisting of three double bedrooms, a large living area with dining and living room, a large terrace and a private swimming pool, for the privacy of the guests. Pitrizza restaurant is the ideal place for romantic dinners by candlelight, crowned by a prompt and impeccable service. Here you can taste the typical dishes of the Sardinian tradition, revisited by the creative talent of the chef, who always adds to his creations a touch of originality. Alternatively, the Bar Pitrizza offers light lunches and refreshing cocktails. Guests can take part in the Lunch and Dine Around Program. Breakfast and lunch are served with a buffet service and the dinner offers an à la carte service. 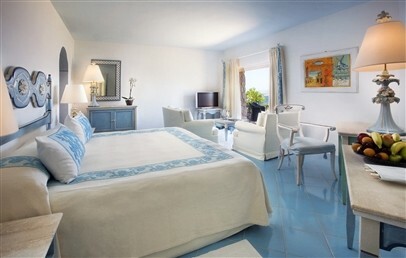 Pitrizza Hotel offers a wide range of services for the entertainment of its guests. From the Wi-Fi zone on the seashore, a fully equipped Business Center; from a wide range of sporting activities for those who want to keep fit (cycling, water skiing, sailing, windsurfing, canoeing, fitness centre, equipped tennis field at Tennis Club Cervo...) to the shopping luxury area. 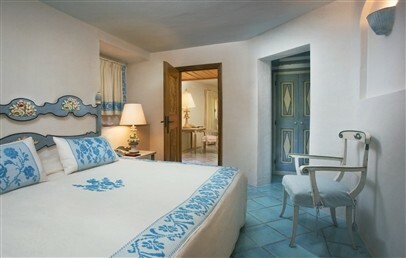 Spacious double room decorated with white walls and dark wood furniture as in authentic Sardinian style. The bathrooms features a rainforest shower enclosed in glass, bathtub, hairdryer, bathrobe, complimentary toiletries and telephone. 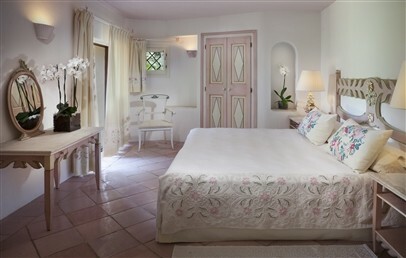 All Superior rooms face a lush green gardens view terrace equipped with cushioned lounge chairs. 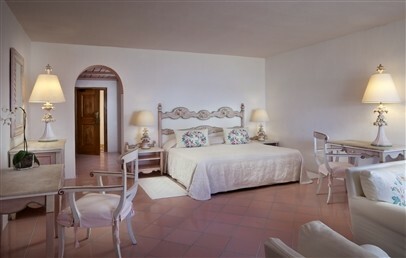 Spacious double room decorated with white walls and dark wood furniture as in authentic Sardinian style. The bathrooms features a rainforest shower enclosed in glass, bathtub, hairdryer, bathrobe, complimentary toiletries and telephone. All Premium rooms face the sea view terrace equipped with cushioned lounge chairs. The Deluxe Suite provides more space, privacy and several comforts. In addition to a large bed room, it consists of a separate living room with sofa characterized by wood and granite. 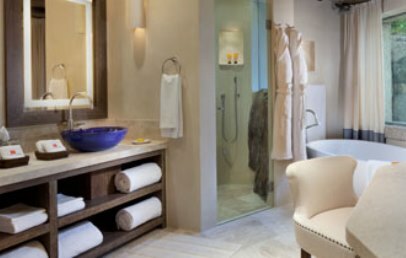 The bathroom features bathtub, hairdryer, bathrobe, complimentary toiletries and telephone. 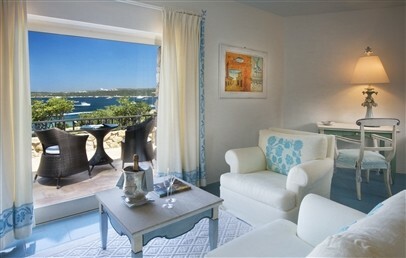 All Suites face a garden or sea view terrace equipped with cushioned lounge chairs. The Premium Suite provides more space, privacy and several comforts. In addition to a large bed room, it consists of a separate living room with sofa characterized by wood and granite. The two bathrooms one with tub and the other with a rainforest shower enclosed in glass, hairdryer, bathrobes and slippers, complimentary toiletries and telephone. 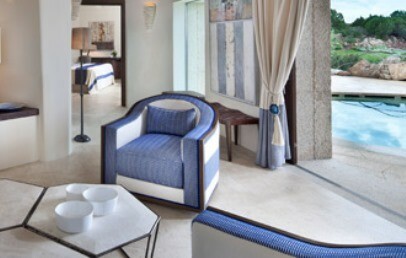 All Premium Suite face a garden view terrace equipped with cushioned lounge chairs. This Suite offers privacy, a very nice terrace equipped with loungers, sun umbrella, outdoor dining area, a heated pool and with an absolutely breathtaking view on the sea. 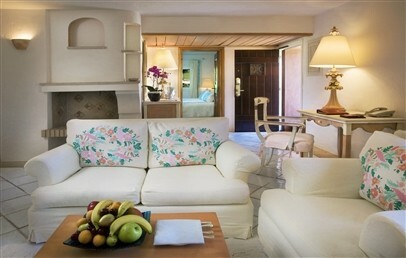 The Suite has bedroom, living room and indoor dining area for 4 to 6 people. The furniture is elegant with a mix of traditional Sardinian pieces and with modern amenities, decorated with light colors. The bathroom has a shower with rainfall shower head, a tub, double sink and complimentary toiletries Acqua di Parma. Food with Style or Style in Food? Wine & Style, Golf & Wine: choose your pair!